Learn From the Thief – But Learn from the Rest of God’s Word Too! Before ascending into Heaven, Jesus told His apostles that the person who believes in the gospel and is baptized will find salvation (Mark 16:16) – is it just a coincidence that baptism is placed before salvation? After preaching Jesus as the crucified, buried and risen Savior, Peter told a crowd waiting anxiously to repent of their sins and submit to baptism under the authority of Jesus to find the mercy from God they desperately wanted (Acts 2:37-41) – is it just a coincidence that baptism is placed before salvation? During a trip to Damascus, Saul (better known as Paul) witnessed with his own scale covered eyes the validity of the gospel, and was told after three days of praying and fasting to get up and get under the water to wash away his sins (Acts 22:6-16) – is it just a coincidence that baptism is placed before salvation? Click here to watch a video about the truth about baptism. An example on how to use the word “and” would be: Go to the store and get a gallon of milk. When we want to tell someone to do two or more things in one sentence then we use the word “and.” I know all of that sounds like a “duh” statement, but I have a reason for speaking so plainly and simply, so please stick with me as I continue to explain. Now, to be honest, English was really my least favorite subject in school, but I do remember some of the lessons that I was taught and the importance and meaning of “and” is one of them. Maybe one of the reasons I still remember it so well is because as a child I learned what the word “and” meant even before I started school. If my parents told me to do something by using the using the word “and,” then I knew whatever they were saying had better be done whether it was before or after the “and” was spoken. It seems as if everyone completely understands what “and” means when it comes to everyday life. When someone gives us directions to a location we pay attention to every “and.” For example, if someone tells us to go straight and turn right at the second red light, then we look for the second red light so we can turn right. If you are cooking and the cookbook says to add one egg and a cup of flour, we don’t just add the egg; we add the egg and flour. Why? Because the cookbook said so when it used the word “and,” right? You see, no person with a simple understanding of the English language will argue about what “and” means – that is until we start talking about what the Bible says about becoming a Christian. If the Bible uses the word “and,” why don’t we look at it the same way that we do any other time? John 4:24; Romans 1:16; 1st John 1:8 “and” Mark 16:16. The title above is a quotation of the end of Mark 16:16. It is contended by some that this verse teaches that the baptism commanded by Christ is not necessary to salvation. Their grounds for the argument rests upon the fact that Jesus did not say, “he that believeth not and is baptized not shall be damned” contrary to the previous statement that both belief and baptism were necessary for the salvation of those that heard the gospel. The stance held by such a person teaches that since Jesus did not condemn the lack of baptism but only the lack of faith on the part of the person hearing the gospel that means that baptism is not necessary to salvation at all. But is that what Mark 16:16 is really saying? Unfortunately, for the person that holds to the doctrine of faith-only, this is not what Mark 16:16 is saying at all. What happens to a person that lacks faith who ends up being baptized, or in other words what happens to a non-believer who is immersed in water? They get wet! Nothing more and nothing less. There was no reason for Jesus to say that the absence of a scriptural baptism leads to damnation because He had already given the way that leads to salvation (Matthew 28:19-20). If a person wants to find salvation then do what Jesus says (Hebrews 5:9). If you want to find condemnation then do the opposite. I really appreciate the King James’ translation when it uses the word “yield” in verse 13. The idea being brought out is the mindset that rejects the rule of sin (hence the old right of way we gave to sin in our body) in comparison to the mindset that now willingly submits to the rule of righteousness (hence the new right of way we give to God with our body). This idea can easily be understood when we think about the rules of the road. 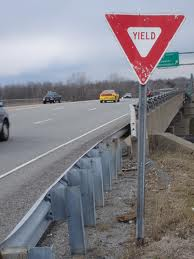 When a person drives up to an intersection that contains the important, yet often ignored, upside-down triangle-shaped YIELD road sign the proper mindset knows what to do. A failure to give the right of way can result in an at fault wreck. Paul is reminding us that with the new way of life comes a new right of way and the time for yielding to sin is over (Romans 6:22-23).